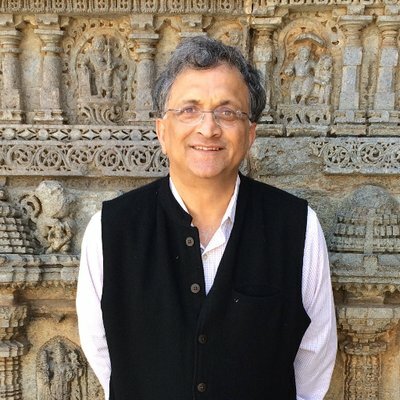 Ahmedabad, Feb 12 :Noted historian Ramachandra Guha on Tuesday heaped praise on the Principal and Vice Principal of a reputed Ahmedabad college for resigning in protest against the denial of permission by the college trustees to let firebrand Dalit leader and Independent legislator Jignesh Mevani to be part of the institute’s annual function. Guha, an internationally acclaimed biographer of Mahatma Gandhi, asserted in a Twitter message: “I salute the Principal and Vice Principal who resigned because their college’s trustees disinvited @jigneshmevani80. “They represent the best traditions of Gujarat. (Sardar) Patel, Gandhi and Hansa Mehta would have been proud of them,” he added. Veteran lawyer and rights activist Prashant Bhushan retweeted Guha’s tweet. In a strongly-worded emotional letter, the Principal of HK Arts College, Hemant Shah, an economist and a rights activist, who quit his post, expressed his shock that the college whose trustees were luminaries of Gujarat would kneel down to pressures from some sundry BJP leaders and refuse permission to allow Mevani on the campus. Shah had invited Mevani, himself an alumni of HK Arts College, to be the chief guest at the college annual function to felicitate students and alumni who had excelled in academics and other areas. The function, which was to be held on Monday, was cancelled before Shah sent his resignation and Vice Principal Mohan Parmar followed suit. The trustees of the college, headed by internationally celebrated architect Balkrishna Doshi, succumbed to threatening calls from some BJP leaders, including some members of the University senate, and withdrew permission to hold the annual day function at the college auditorium if Mevani was to be a part of it. The trustees include eminent Gujarati litterateurs Kumarpal Desai and Yashwant Shukla. According to Shah, some BJP leaders threatened to disrupt the annual day celebrations if Mevani entered the college campus. “We are shocked and had to cancel the annual day function on Monday because the trustees would not allow us to use the auditorium. “In fact, the trustees of such eminence before whom I am only a small fry should have provided strength to me to go ahead with the innocuous function instead of themselves shrinking with such misplaced fear,” Shah told IANS. Mevani, who had spearheaded a Dalit agitation after the flogging of four Dalit youths in Una by some self-styled cow vigilantes, was elected to the Gujarat Assembly from Vadgam constituency in Banaskantha constituency in north Gujarat with the support of the Congress. Mevani wondered what the BJP was scared of.